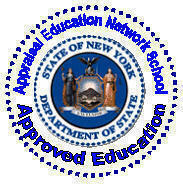 We are approved for On-Line 75 Hour Salesperson Course in NYS- We are proud to be the First School on Long Island, New York allowed to offer On-Line 75 Hour Salespersons Course. We also are ARELLO Certified. Description: This package includes the required online course, and the following textbooks: New York Real Estate Sales - The Complete Guide and New York Real Estate Sales - Review Crammer. The comprehensive online course covers the fundamentals of the real estate profession as needed to implement the required NY 75-hour curriculum requirement. The course introduces students to everything from real estate law to property management – everything future real estate professionals need to know to not only pass the state licensing exam, but successfully enter their new career. New York Real Estate Sales – Review Crammer has a concise review of all the key concepts and hundreds of practice questions. New York Real Estate Sales – The Complete Guide is the required textbook for the classroom course; intended to complement the online course and provide an additional convenient way to learn the material. 2. Take the Proctored test at our school. Once you complete the course you will be permitted to take the final. Pass it and receive your 75 hour course certificate. The Final Exam- Proctored Exam is Free. If you must take a make-up test, as a result of failing the final, there is a nominal $ 50.00 charge to take a make-up exam. Only 1 make-up exam is permitted. Study, relax and you should be able to pass our exam and the state exam. "This site has been viewed times"
After you complete the course, and receive confirmation of same, all you have to do is take the Final Examination at the School, by making an appointment with the School Director, Bill C. Merrell. The Course fee will include all on-line materials, or you can select the option in which books and study material is also sent to you. Call us to let us know after you sign up! We want to track you performance!